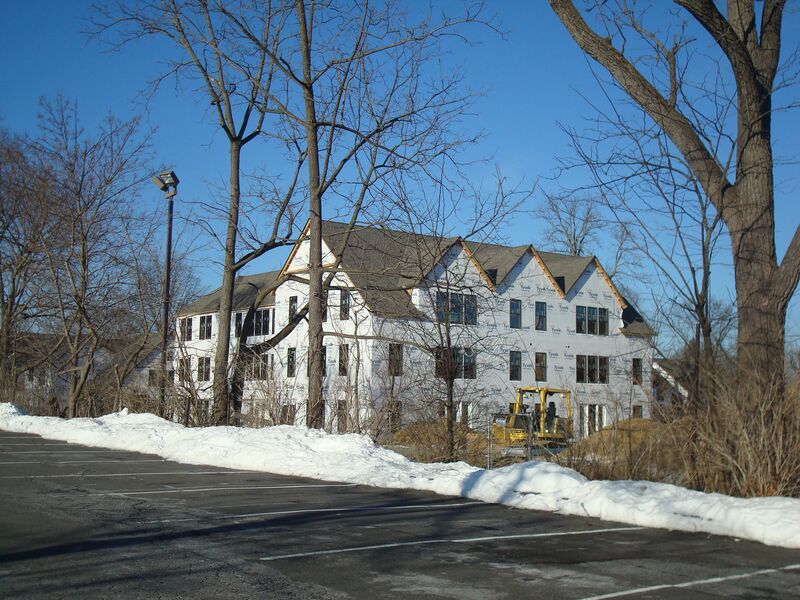 In addition to building a new roundabout and its ‘Arts and Transit’ complex, Princeton University has made major progress this winter with construction at its Merwick-Stanworth housing site. Merwick-Stanworth is an infill redevelopment to construct 326 units of graduate faculty/staff accommodation. The buildings will be located north of Princeton’s YMCA, and between Route 206 and John Street (see map below). Previously, the Merwick Care Center was located at the southern part of this site, before relocating to Plainsboro in 2010. The University already operates housing off Stanworth Drive, at the northern part of the site. This housing was built in the 1940s and is scheduled to be replaced. A map of the final site plan can be viewed here. At this point, the frames of many of the buildings at the southern part of the site have been completed and roofs and windows are being added, so we can get a pretty good impression of the final ‘look’ of the project. 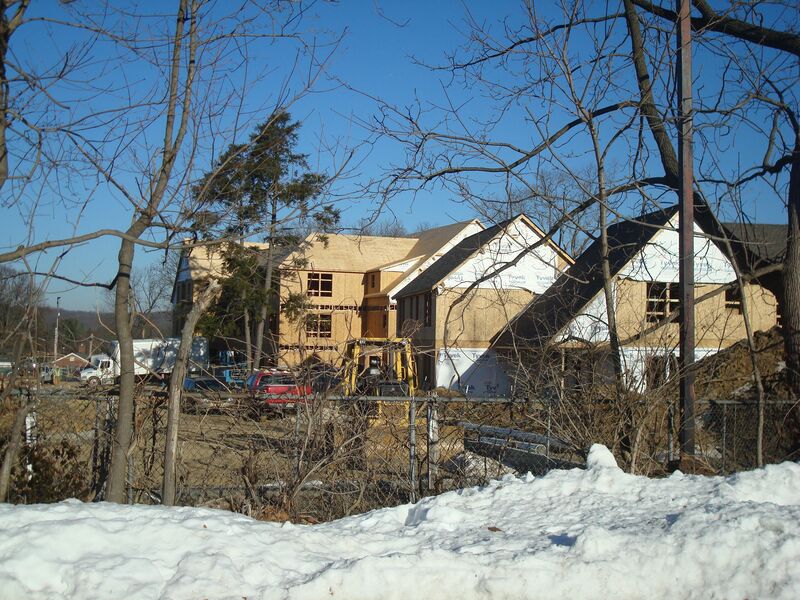 These photos were taken from the parking lot of the YMCA in January 2014. The buildings are going up fast, considering that the plans were only unveiled about a year ago. The housing will be fantastic news for moderate-income families seeking housing in Princeton, as 20% of the units will be designated affordable units, overseen by Princeton Community Housing. The housing will also contribute to Princeton University’s housing masterplan, which will result in 70% of graduates being offered University accommodation. The housing plan has been criticized for not providing accommodation for all the graduate students who need it, but the new accommodation is certain to be superior to existing options. The good news for future tenants of the apartments and townhomes of the Merwick-Stanworth development is that many of the amenities of downtown Princeton and the University are sufficiently close by as to make walking and cycling to them possible. 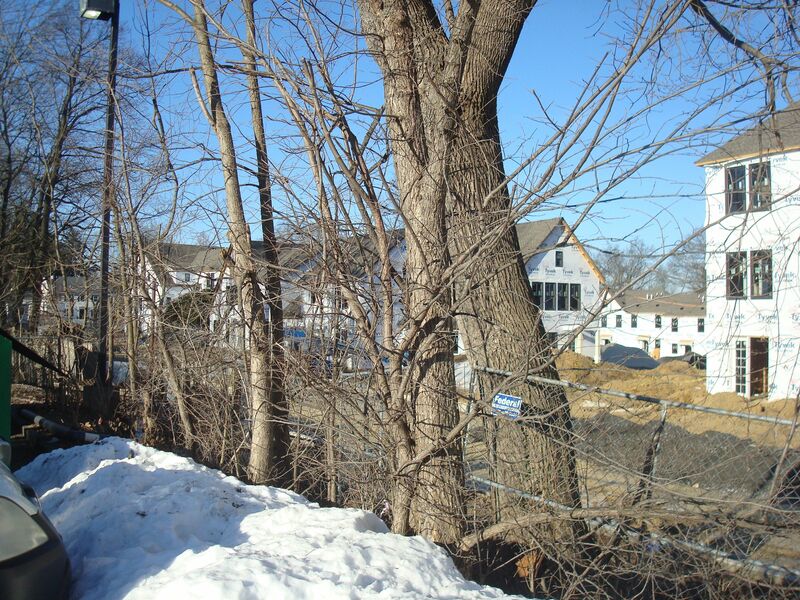 Merwick-Stanworth will be a great development for improving access to walkable housing in Princeton, and we hope that similarly progressive infill redevelopment can take place at equivalent sites in the town. * Updated 6.27.14 – the article was amended after a reader pointed out that the Merwick-Stanworth redevelopment is for faculty and staff, not graduate students. What do you make of the Merwick apartments? Do you like what you see so far? Would you like to live in an apartment at this site? Leave your comments using the box below! This entry was posted in Affordability, Density, Princeton, Real estate, Smart Growth and tagged graduate, Princeton, Princeton University. Bookmark the permalink. Its hard to tell from the plan, but I hope there is a pedestrian/bike entrance/exit somewhere other than to 206. This site is definitely in biking distance of the University/downtown, but 206 is not a very bike-friendly road. On the plans it looks like there might be a path to John St, which seems like it would be a much superior option. Thanks- that has been corrected.